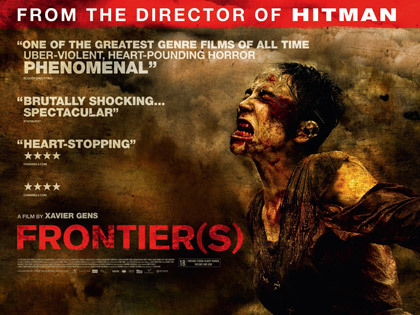 So if you liked Switchblade Romance (or Haute Tension or High Tension depending on what country you live in), you're going to love Frontier(s) when it is released in UK cinemas by Optimum on March 14th. Admittedly, the first film by the director of Hitman Xavier Gens, Frontier(s) is slightly derivative of countless other similar stalk'n'slash movies (Texas Chainsaw for starters), but where it differs is with it's stunning style and voracious viciousness. Having seen the film last year at Film 4 Frightfest's ICA all-nighter, we strongly recommend you check out this great European horror when it opens in March. As the banlieues of Paris burn due to riots protesting the election triumph of an extreme right-wing party, a group of youths use the chaos as cover for smash-and-grab robberies. For Yasmina (Karina Testa), the money is an escape from the slums she has known all her life. 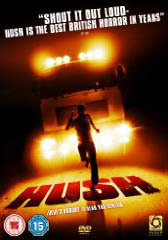 With the police on their tail, her gang splits up, planning to meet at an inn near the Luxembourg border. Arriving at their destination, they encounter their hosts, the Von Geisler clan, who seem to be stuck in time: a jackbooted patriarch, his savagely flirtatious daughters and his thuggish sons. Revealing themselves as neo-Nazi fanatics, they see Yasmina as a fresh bloodline for their fascistic fantasy of starting a new Aryan brotherhood. Her friends find themselves trapped in a grim abattoir as Yasmina fights against the Von Geisler’s invitation to become ‘one of the family’ in their twisted Gothic household. If you like your comedy horror movies trashy and 80s then you’re in for a treat. Big scary trucks...where would we be without them? Coming on like Mr. Blobby’s evil sibling, Jerkbeast stomps from one argument to another stealing the movie completely.